How to get there: Fly to Volos and then take a 30-minute bus ride. Alternatively take the bus from Athens (3½ hours) or Thessaloniki (3 hours). A mix of romance and tragedy lingers in Damouchari to this day. In 1910, Apostolis Vainopoulo, a wealthy sea captain, decided to invest in the port, hoping to increase its trade. He built a beautiful villa for his young bride, but she died tragically before the building was completed. Vainopoulo remarried, and his grandson still owns the villa and has converted it into a hotel and tavern. Members of the Mamma Mia! cast, including Meryl Streep, stayed here during filming, and the villa boasts terraces in each room overlooking the gardens and the restaurant serves a selection of fresh seafood overlooking the harbour. Cars are still prohibited in most of the village, contributing to peaceful atmosphere of this idyllic location. 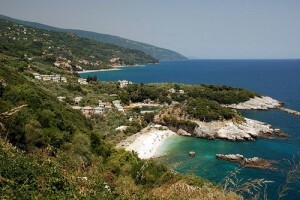 A number of the film’s beach scenes were filmed on the island of Skiathos, part of the Sporades island chain. The island’s Old Port and St. Nikolaos Bell Tower were also featured. Skiathos and its town of the same name have played roles in several events in Greek history as both a strategic stronghold and hideout, including the Persian Wars and the War of Greek Independence. The Greek flag was first constructed and flown in the Evangelistria monastery on the island in 1807. During July and August, the town is host to an annual festival at the ancient Greek theatre of Limenas, and the Feast of the Virgin Mary in August prompts a series of celebrations and events across the island. In addition to its many celebrated beaches, Skiathos is the most developed of the three main Mamma Mia! locations, and therefore has the most to offer in terms of hotels, restaurants, and activities. Sailing and chartering boats is a popular and luxurious way to travel to the many smaller islands in the area or to relax on a cruise around this impressive isle. Skiathos island features heavily in the movie, with the old winding streets acting as a playground for a number of the chase scenes between Colin Firth and Pierce Brosnan. The port was made up by film crew to look more 1970s, using local people as extras dressed in more period costumes. Camera crew used ferry boats, quad bikes and cars to film from, turning the island into a hub of excitement for the whole filming period. This charming beach location is a perfect holiday destination. Most of Mamma Mia! was filmed on Skopelos, a remote island an hour’s boat ride from Skiathos. Donna’s inn, as well as the Agios Ioannis Chapel, the beautiful church that featured in the film’s finale are both located on the island. Legend has it that the island was founded by Staphylus (the Greek word for grape), who was the son of Dionysus, the god of wine. To this day, the island has a number of thriving vineyards and olive groves. 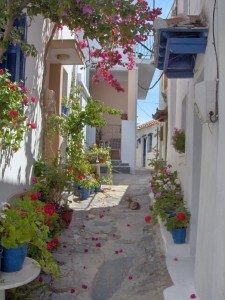 The island’s village narrow streets are lined with flowers, and the dramatic landscape contributed to selecting Skopelos as the film’s primary location. Villa Donna and the cliffs the men jump off of in Mamma Mia are located in the area surrounding Glysteri Beach. The sparkling beaches, old-world villages, and breathtaking mountains and cliffs make this an ideal choice for travellers looking to get away from it all in a secluded corner of Greece. 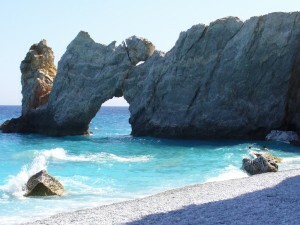 Skopelos is secluded and peaceful, and one of the best kept secrets in Greece. It is known as the greenest Greek Island due to the amount of flora and fauna, and remains relatively untouched by the saturated tourist market.